To be fair, the experience hasn't been all bad so far, and before I start whining too much, how about some parts I've enjoyed? At the top of the list has to be the hilarious, bizarre courtship between Dorothea and Casaubon. Casaubon's dry, didactic letter of proposal somehow managed to move Dorothea to tears, despite that all he really offered her was “affection.” (Just the steamy promise every young bride hopes for!) Because the young lady is convinced the ideal husband should be some kind of father figure, the elderly scholar checks all the boxes. The horrified reactions of literally everyone else when they find out the two are engaged are memorable, to say the least—exclamations like “Good God! It is horrible! He is no better than a mummy!” and “She says he is a great soul.--A great bladder for dried peas to rattle in!” (Ch. 6). I don't think I've ever encountered another character who was so certain of what she wanted, and so awfully unfortunate as to get exactly that. Dorothea is certainly a complicated person. At first I despised her. I couldn't stop rolling my eyes at her stodgy refusal to have any fun, ever. She wants so badly to be a hero and sees herself as a doting benefactress taking care of poor, helpless wretches. She is disappointed that Casaubon's tenants are so well-off, because they don't need her help and therefore can't be the objects of her narcissistic savior fantasy. She frostily refuses to consider the possibility that the handsome young bachelor who keeps turning up at their house might be doing so out of a desire to see her, instead stubbornly insisting he is a suitor for her younger sister. She has an overwhelming desire for learning, yet she wants to subjugate herself entirely to the will of her husband. What a frigid, dreary person Dorothea is! I want to take her to a bar, order her a beer, and then drag her to the bathroom and fix her outfit the way Melissa McCarthy does for Sandra Bullock in The Heat. Upon deeper reflection, though, I had to admit that I may have had some Dorothea-like qualities myself in my younger years, and that my frustration and impatience with her might actually be directed at my past self. Seventeen-year-old Taryn was pretty tightly wound. She likely could have benefited from a beer and a few sleeveless shirts, is what I'm saying. So I'm trying to be a little more patient with Dorothea and give her some grace, because it's clear from her honeymoon-in-name-only with Casaubon in Book 2 that their marriage isn't going to go well. When the best conversations you have on your honeymoon are with your husband's much-younger second cousin, you can't have very high hopes for the fate of your marriage, can you? 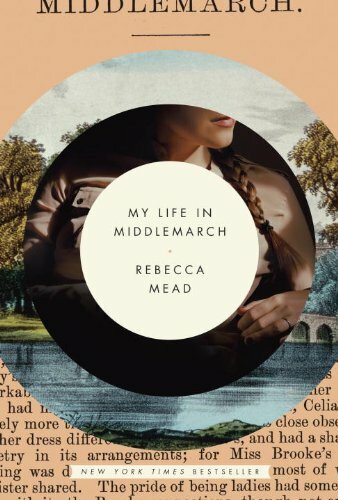 I'm happy to report that Rebecca Mead's My Life in Middlemarch is, as I hoped, an excellent and illuminating companion to the novel. Mead has spent a lot of time researching Eliot's life and work, and I am thoroughly enjoying the fruits of her labor, especially because I had no intention of spending the time myself on such minutiae. The part I've found most helpful so far is her explanation and defense of Eliot's frequently halting the story to insert lengthy paragraphs of narration and third-party character analysis. Mead writes, “The explicit intrusion of a narrator's voice in Eliot's fiction can strike the contemporary ear as old-fashioned. Today's realist novelists don't tend to step onto their pages, formally addressing the reader like a lawyer making a case before a courtroom” (54). Indeed, they don't, Ms. Mead, and for good reason. While Mead wasn't able to convince me of the charm of Eliot's authorial voice, I was grateful at least to put words to my irritation. Apparently I'm a creature of my historic moment. “Correct English is the slang of prigs who write history and essays. “And I should never succeed in anything by dint of drudgery. Well, what else is there to say, but onward! These next 600 pages aren't going to read themselves! Comments are open below. How is the book going for you? What have you enjoyed? What have you struggled with? Who do you think is the most frustrating character? The most relatable? How do you feel about Eliot's intrusion on the action of the story? How much do you wish you hadn't agreed to do this?